Dr. James Olsen is an Ann Arbor native. He holds two degrees from the University of Michigan, with a bachelor's degree in psychology in 1984 and then graduating from the University of Michigan School of Dentistry in 1988. Dr. Olsen opened his private practice here in Ann Arbor with just one operatory and one employee. Thanks to the support and loyalty of his patients, our practice has grown into a beautiful, state-of-the-art, high-tech facility capable of delivering the highest quality dentistry available. Dr. Olsen's team has grown a bit, but they haven’t sacrificed the personal connections they enjoy with each our patients. 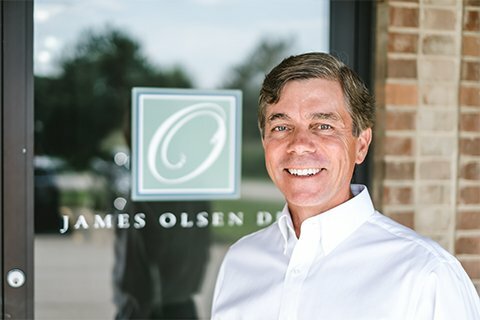 A passion for learning has led Dr. Olsen to regularly pursue advanced training and education in all facets of dentistry. Because of his interest, he regularly attends local and national dental meetings, achieving an average of over 100 hours per year of continuing education. He has taken his knowledge and skills as a clinician to the next level by attending the prestigious Las Vegas Institute for Advanced Dental Studies. During his studies at LVI, Dr. Olsen learned the most advanced methods in cosmetic and reconstructive dentistry. His training also included advanced education in neuromuscular dentistry. This has drawn many patients to his practice seeking relief from years of TMJ and headache pain. Dr. Olsen has been a big supporter of local baseball and soccer programs through his participation as a coach with various teams while his kids were playing sports. He has also sponsored many teams and events and been active in numerous community projects as well. He supported the Saline Fiddlers and other Saline music programs while his kids were participating. Now Dr. Olsen supports, programs such as Saline Area Social Services and the Foundation for the Saline Area Schools. For fun Dr. Olsen enjoys any activity outdoors and traveling with his wife.